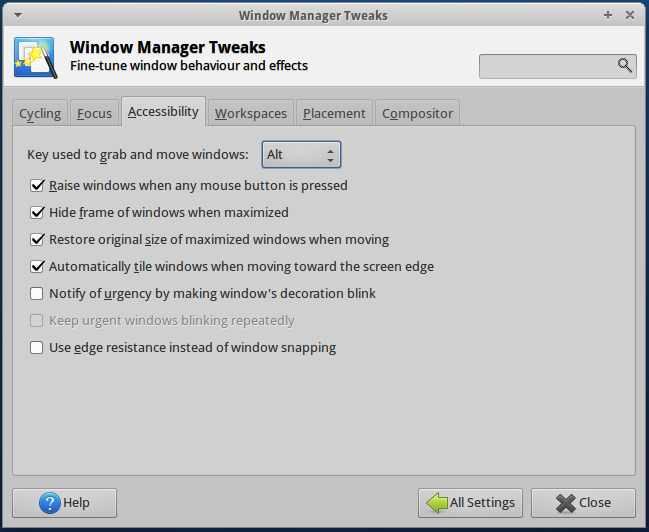 In XFCE, when holding down Alt and then clicking anywhere in a window with the left button will move that window (as if by dragging the title bar), or resize the windows when clicking and dragging with the right button. I like this feature very much, and I'm used to it, since forever. But I've always had it bound to Super-L(left "Windows"-Key). How do I change the behavior of Alt for Super-L? I was looking at XFCE Settings Manager but I couldn't find it anywhere. As @jim-stewart wrote in his note, the "Window Manager Tweaks" does not seem to be installed (in some cases / by default) in the current xfce. set easy_click to Super" (it'sAlt` by default). Not the answer you're looking for? Browse other questions tagged keyboard-shortcuts xfce window-manager or ask your own question. How do I change XFCE tiling to maximize on top edge? How to move the window controls to the left when using Compiz on XFCE?